If you’re one of the 25 million Americans who has symptoms of acid reflux every day, you should make an appointment with your doctor. Persistent, untreated acid reflux can not only be very uncomfortable, but it can also lead to more serious health problems, including an increased risk of esophageal cancer. Early diagnosis and treatment are important to prevent the development of these more serious conditions. Ongoing acid reflux, also known as gastroesophageal reflux diseases (GERD), is caused by weakness in the ring of muscle at the bottom of the esophagus that opens and closes as you swallow to move food into the stomach. When it’s working normally, this ring of muscle, called the lower esophageal sphincter (LES), opens to let food and liquid move down into the stomach and then closes. If you have GERD, the LES remains partially open most of the time and allows stomach acid to splash up into the esophagus. Over time, this acid reflux can irritate and wear away the lining of the esophagus. 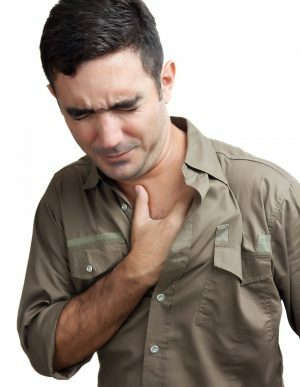 Are you at risk for acid reflux disease? The most common symptom of GERD is heartburn, though some people with the condition do not experience heartburn. For most people, the pain is worse when lying down and can cause you to wake up during the night. Because many of these symptoms can also be caused by other serious health problems such as asthma, angina, and sinus and vocal cord problems, it’s important to see your physician to get an accurate diagnosis and a referral to a specialist when appropriate. The complications that this type of acid reflux disease can cause make effective treatment essential. Left untreated, GERD can cause a range of serious problems, including ulcers in the esophagus, strictures or narrowing of the esophagus, and aspiration of acid into the lungs which can cause inflammation and infection. GERD can also contribute to the development of a condition known as Barrett’s esophagus which occurs in 10% of people with GERD. The constant exposure to acid can cause pre-cancerous changes in the cells in esophageal lining. Over time, these cells can become cancerous. Regular endoscopy can check for cell changes and help detect esophageal cancer in its early stages. The first step in lessening the effects of GERD are usually lifestyle changes including losing weight, quitting smoking, eating smaller meals, waiting three hours after eating before lying down, and avoiding foods that make your symptoms worse like tomatoes and other acidic foods, fatty food, caffeine, chocolate, peppermint, garlic, onions, and alcohol. In some cases, if medication and lifestyle changes do not provide adequate symptom relief and healing of the esophageal tissue, surgery may be needed. A health advisor can help you connect with specialists who are experienced treating acid reflux. Accurate diagnosis and a treatment plan tailored to your specific situation can help restore your quality of life and decrease your risk of developing serious complications from GERD.